Lennox X8349 PureAir Healthy Climate PCO-12C MERV 10 Annual Maintenance Kit with Insert 17" x 26" x 4"
DiscountfurnaceFilter.com is the web's #1 source for the Lennox X8349 MERV 10 filter. Order your Lennox X8349 MERV 10 filter today and receive fast, efficient, FREE Shipping on Orders Over $125 (Continental U.S.)! 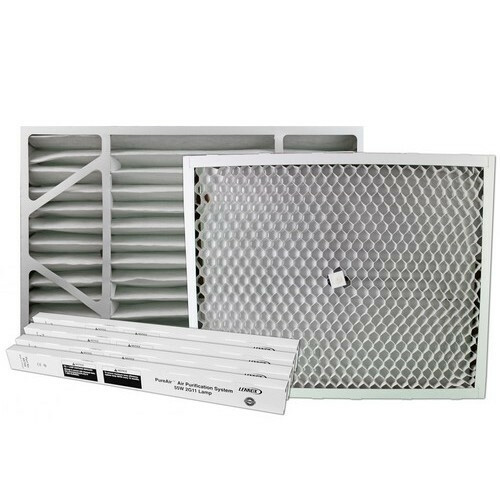 This Lennox air filters kit includes the UV bulbs, MERV 10 filter and the metal mesh insert intended for the PureAir PCO-12C unit. Improve air quality in your home with Lennox air filters. NOTE! This Lennox X8349 new generation kit features a mesh insert that is collapsed to 1" thick for shipping.Click here to review the instructions for expanding the 1" to the full 2" width. You're reviewing: Lennox X8349 - PureAir PCO-12C MERV 10 Annual Maintenance Kit with Insert 17" x 26" x 4"